Colourful embroidered stars surrounding a name personalised on your choice of bath towel colour. Colourful embroidered stars surrounding a name personalised on your choice of bath towel colour. A great gift that is so useful at home, the beach, holidays this towel is made one of a kind! Enter the name to be personalised and also enter 2 or 3 thread colours you would like the name and stars embroidered in. 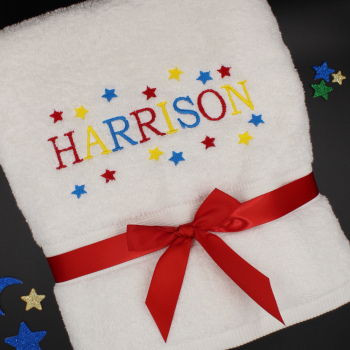 Colourful embroidered stars surrounding a name personalised on your choice of bath towel colour. A great gift that is so useful at home, the beach, holidays this towel is made one of a kind! Enter the name to be personalised and also enter 2 or 3 thread colours you would like the name and stars embroidered in. Our Example: red, yellow, navy threads. Bath Towel 75x125cm in your selection of towel colour. Custom made to order personalised towel gift with your own personalised options.